Difference between revisions of "Manage users"
*delete the user from the survey administrators database - by clicking the wastebin button. *set global permissions for a user - by clicking the lock symbol. *set template permissions for a user - by clicking the pen-and-lock symbol. *set theme permissions for a user - by clicking the pen-and-lock symbol. The CRUD (Create, read, update, and delete) system is employed (like in the [[Manage users#Setting permissions for a single survey|survey permission settings]]). To fine-tune user permissions, we strongly recommend to extend the matrix using the double-right arrowhead, which is located in its upper right corner. If you check the first box, all the CRUD permissions situated on that row are automatically checked. The CRUD (create, read, update, and delete) system is employed (like in the [[Manage users#Setting permissions for a single survey|survey permission settings]]). To fine-tune user permissions, we strongly recommend to extend the matrix using the double-right arrowhead, which is located in its upper right corner. If you check the first box, all the CRUD permissions in that row are automatically checked. * '''Label sets''': Permission to create, view, update, delete, export, and import label sets. The label sets don't have specific permissions (unlike design templates). * '''Label sets''': Permission to create, view, update, delete, export, and import label sets. The label sets don't have specific permissions (unlike themes). * '''Settings & Plugins''': With this permission a user can check data integrity, save the SQL database to an .sql file, manage global setting, view the PHP info in the global settings, and manage all plugins. * '''Settings & Plugins''': With this permission a user can check data integrity, save the SQL database to an .sql file, manage global settings, view the PHP info in the global settings, and manage all plugins. * '''Surveys''': This gives access to all surveys. To allow a user only to create and manage their own survey survey, only give the user the 'create' permission. A creator of a survey is the owner of the survey and will always be able to manage it. Remember that each survey can grant to users different permissions. * '''Surveys''': Gives access to all surveys. To allow a user to only create and manage their own survey, give the user the 'create' permission. A creator of a survey is the owner of the survey and will always be able to manage it. Remember that each survey can grant different permissions . * '''Superadministrator''': This permissions can only be added or removed by the user called '''admin''' and grants full permission to the whole LimeSurvey installation. * '''Superadministrator''': This permissions can only be added by other Superadministrator with this setting as update and grants full permission to the whole LimeSurvey application. *'''Use internal database authentication''': This permission allows users to access LimeSurvey's panel via the authentication page (e.g. ''http://domain/admin/authentication/sa/login''). If it is unchecked and the respective user tries to connect to the LimeSuvey's panel, he will get the following error: 'Internal database authentication method is not allowed for this user'. *'''Use internal database authentication''': This permission allows users to access LimeSurvey's panel via the authentication page (e.g. ''http://domain/admin/authentication/sa/login''). If it is unchecked and the respective user tries to connect to LimeSuvey's panel, he will get the following error: 'Internal database authentication method is not allowed for this user'. Select the design templates to which the respective user or user groups should have access to. After you finished your selection or deselection, do not forget to hit the '''Save''' button: [[File:Save.png|0.75px]]. Select the design themes to which the respective user or user groups should have access. After you finished your selection or deselection, do not forget to hit the '''Save''' button: [[File:Save.png|0.75px]]. To enable this login method, the line [[Optional settings#Use_one_time_passwords|<code>$use_one_time_passwords = false;</code>]] has to be set 'true' in config.php (it is 'false' by default) . Maybe you can set it like " 'use_one_time_passwords'=>true " in the 'config' array in config.php , don't forget the ',' symbol. To enable this login method, the line [[Optional settings#Use_one_time_passwords|<code>$use_one_time_passwords = false;</code>]] has to be set 'true' in config.php (it is 'false' by default) . * The passed username has to exist in LimeSurvey's ''users table''. * The one-time password (which can be set via an external application) has to be stored as [https://secure.php.net/manual/en/function.md5.php MD5 hash] in column ''one_time_pw'' of table ''users''. * (This should be ignore except "Both passwords have to match")The passed plain text password will be hashed using the sha256 function and will then be compared to the stored hash in column ''one_time_pw'' of table ''users''. Both passwords have to match. * (This should be ignored except "Both passwords have to match") The passed plain text password will be hashed using the sha256 function and will then be compared to the stored hash in column ''one_time_pw'' of table ''users''. Both passwords have to match. * After the first login with the one-time password, it gets deleted from the database. The user won't be able to log in anymore with that respective password a second time. * My local LS system can't test the permissions with different accounts . (My E-mail password do not have a way to be getted). * My local LS system can't test the permissions with different accounts (my email password does not have a way to be connected). These permissions only apply for a single survey. If you want to set permissions for the whole system, you can use [[Manage users#Set global permissions for a user|global permissions]]. These permissions can be offered either to a single user or to a user group. Click on the double-right arrowhead to access the extended version of the matrix to choose specifically the actions that can be performed by a user. After you finished editing the survey permissions, click on the '''Save''' button, which is located in the upper right part of the screen. After you finished editing the survey permissions, click on the '''Save''' button, which is located in the upper right corner of the screen. Some examples are provided [[Manage_users#Examples|below]] in order to help you get a better understanding of the Limesurvey's survey permissions system. 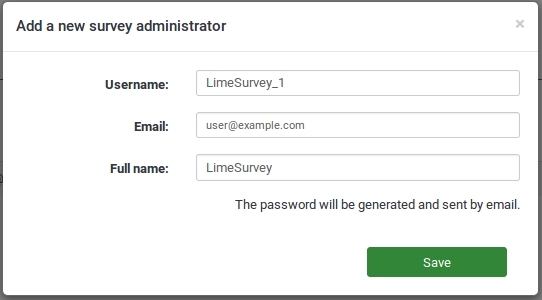 Some examples are provided [[Manage_users#Examples|below]] in order to help you get a better understanding of Limesurvey's survey permissions system. * Create a new user account. * Grant that user the '''Superadministrator''' permission. * ''Not necessary'' : Setting the template permissions ('''Superadministrator''' has all permissions for all templates). * ''Not necessary'' : Setting the theme permissions ('''Superadministrator''' has all permissions for all themes). * ''Not necessary'' : Setting the survey permissions ('''Superadministrator''' has all permissions for all surveys). * Set global permissions for that user to '''Create survey'''. * ''Optional'' : Set template permissions - select which template(s) should be used by the user/user group. * ''Optional'' : Set theme permissions - select which theme(s) should be used by the user/user group. * Set '''no global permissions''' for user. * Set '''no template permissions''' for user. * Set '''no theme permissions''' for user. * Set the survey permissions the way you want. If he/she should receive all the survey permissions, you can check the first box from each row. Otherwise, click on the double-right arrowhead to see the expanded matrix (upper right corner) and select only those rights you believe the respective user should have. * Set survey permissions to: '''Responses''' -> '''View/read''' and '''export''', and '''Statistics''': '''View/read'''. * Create a user group called ''Translators'' and add the ''n'' accounts to this group. * Go to the '''Survey permissions''' and click on '''Add a user group'''. * If they do only translations, then offer them the '''Quick translation''' permission. * If they only do translations, then offer them the '''Quick translation''' permission. All the permissions mentioned above that belong to the forced super administrator cannot be removed via the GUI. By default, an user (non-admin) cannot grant survey permissions to users that are not part of the same group as the survey administrator. This is a security option enabled by default in LimeSurvey. To change this, you need to deactivate option Group member can only see own group, located in the Global settings, under the Security tab. However, if you feel unsure about disabling this option, you can create groups containing those users that can be seen and be granted survey permissions by a survey creator. This page was last edited on 8 November 2018, at 15:48.